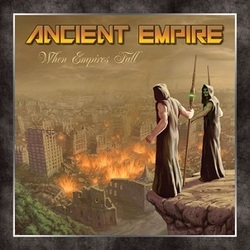 Featuring Joe Lizst of Shadowkiller and formerly Rocka Rollas as well as a bevy of former Hellhound musicians, Ancient Empire comes from the bay area and delivers it's traditional debut album upon the crowds. First off, if you are a fan of Shadowkiller (and if you haven't heard them yet, shame on you! ), you know what to expect here as Ancient Empire could well be their twin brother. The sound is similar (never mind they share a vocalist), as musicially both bands share a common direction. Enough of the other band as this is an Ancient Empire review after all. AE mix some incredibly efficient music with plenty of melody and a certain majestic feel without sounding cheesy in the least. The music has what is becoming a very Northern California vibe (or StormSpell vibe?) of rich hooks overladen with good to great musicianship. The vocals are pretty mid level without too many highs or lows, but they really work great with the backdrop provided by the rest of the sound. The production is crisp and well done, overall a very healthy and professional package. There are so many highlights on this album that it's tough to pick favorites. If I am forced at gunpoint I would have to say Shadow Of The Cross, In The Killing Fields, Wings Of Steel, Ghost Soldiers and maybe The Final Day. Arguments can also be made for Ancient Empire and When Empires Fall as well, as I said so many high points and no filler on here. By the sound of the music, I have a feeling that this Ancient Empire is not going to fall anytime soon! !